Biochar was used by farmers in the Amazon Basin more than 2,500 years ago, and now it is becoming a hip commodity in the cannabis industry. And while it has many benefits as a soil amendment for cannabis growers, biochar may be a remedy for climate change, as well. 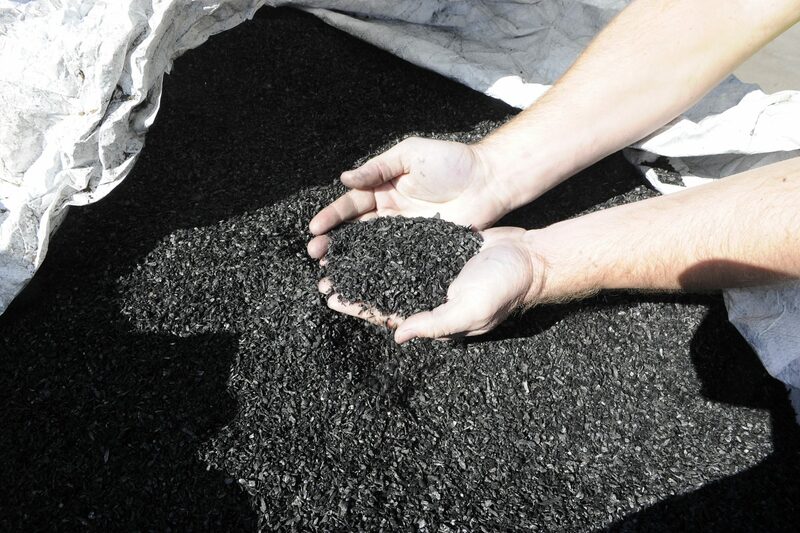 Biochar is charcoal produced from plant matter. It is made using a process called pyrolysis, which involves placing biomass into a special oven and heating it in the presence of little or no oxygen. The final product can capture carbon and lock it into the soil. That last part is the key to the more global benefits of biochar potentially reducing greenhouse gases such as methane and nitrous oxide. As a soil amendment, biochar can increase soil fertility, increase agricultural productivity and provide protection against some foliar and soil-borne diseases. 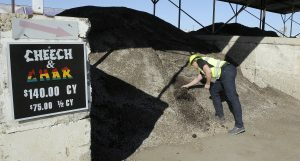 Grants Scheve of Oregon Biochar Solutions grabs a sample of the Cheech & Char soil mix at Biomass in White City. Biochar attracts water and nutrients through a process known as CEC, “cation exchange capacity,” which allows your soil to attract these healthy staples and hold onto them. Because nutrients are retained, growers can use less fertilizer for both indoor and outdoor grows, says Grant Scheve of Biochar Solutions in White City. Biochar is mixed into the soil, with the amount linked to the pH of your soil and other factors. “We always recommend applying biochar directly to the root growth zone of your plants,” says Scheve. “Generally, we see the best results at a 10 percent by overall soil volume inclusion rate. However, we do have reforestation nurseries using … 25 percent raw biochar with fantastic results, and Wageningen University and Research in the Netherlands is conducting trials at 50 percent by volume to replace peat moss with great preliminary data. “We have learned that our Rogue Biochar will hold 6.5 times its weight in water,” Scheve says. “The most efficient way is to include the biochar into your soil media procedure so there is an even distribution throughout the pots or beds. From a forestry perspective, biochar is good news, too. “The majority of the wood feedstock we use is from clean logging residuals,” Scheve says. Northwest Forest Products, which is primarily a forestry company, has gotten into biochar as a natural ancillary. The company thins forests to reduce fuels and the potential for catastrophic wildfire, and to promote forest health and wildlife habitat. But instead of burning the slash down to ash, or letting it rot and release carbon dioxide into the atmosphere, it is being made into biochar. A group called the Northwest Biochar Working Group is working to raise awareness of the benefits of biochar. The group, composed of people from public organizations and private companies, is committed to building an industry that uses biochar to address the region’s pressing challenges, including stewardship. Biochar isn’t available only to soil scientists and forest workers. At Walmart you can get a gallon bag of Wakefied Biochar Soil for approximately $40. At Blackbird Shopping Center, you can try Bigfoot’s version, which costs $16.99 for 4 ounces. At Oregon Biochar, you can get it in bulk for $135 a cubic yard. For a bagged truckload, it costs $199 per yard. The company also has two cubic yard “Supersacks” for $499.